This looks like a good deal. Littlemachineshop.com has a die-holder for the mini-lathe on sale for $18.95 through Tuesday, May 19th. The regular price is $32.95. I have been planning on making one of these for almost a year but I never got around to it. Two weekends ago I really needed one so I made a quick substitute that was just good enough to get the job done. I will be ordering one of these tomorrow. It looks like a nice one and at this price I don’t think it is worth taking the time to make your own. If you are not familiar with this tool, a die holder is used on a lathe, drill press or a mill to ensure that a die gets started straight and centered on the work piece you are threading. 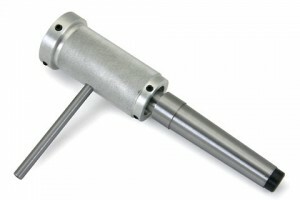 This one is held in the tailstock, although some are designed to be held in a drill chuck. LMS was surprised by the demand and quickly sold out of these. To their credit, they gave me and everyone else who ordered and did not get one a $14 gift certificate that can be used when they are back in stock or for any other purchase. BTW, I have no association with LMS. I just think they are a pretty good company to do business with. Keep up the good deals. I just joined this site and have been very busy for the past couple days just going through all the articles that are available. I like your posting of ” Good Deals ” I buy from LMS because of the quality of the products that they supply and I can find accessories and parts for my Mini Lathe 7 x 14. I also like the LMS site for breaking in a new lathe. I do get to Harbor Freight on occasion and find deals that I am looking for.